HubSpot Field to Field Sync allows mapping with HubSpot contact properties and the WordPress users’ fields. The selected properties can be mapped to the desired user field of WordPress by just enabling the add-on & doing some mappings. Easily map contact properties of HubSpot with the WordPress users’ fields. 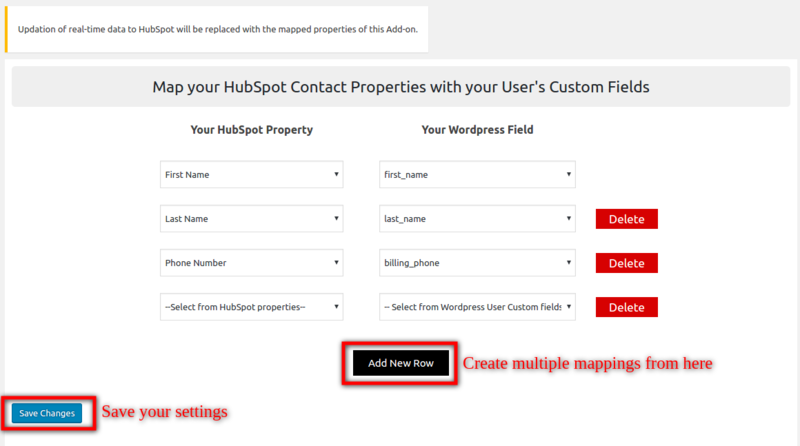 Mapping new or existing contact properties with custom fields over HubSpot has now become easier. Note: If you want to use HubSpot Field to Field Sync, firstly you need to install parent plugin HubSpot WooCommerce Integration Pro or HubSpot WooCommerce Integration by Makewebbetter(free version over wordpress.org). Automatic installation is the easiest option as WordPress handles the file transfers itself and you don’t need to leave your web browser. 1. 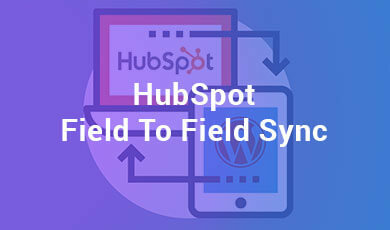 Download the zip folder of the plugin HubSpot Field to Field Sync. 2. Once downloaded install the plugin through browsing and activate it. Manual installation of the plugin is another option to install the plugin to your WordPress-environment. The manual installation method involves downloading our HubSpot Field to Field Sync.Extension and uploading it to your web server via your favorite FTP application. 1. Upload the HubSpot Field to Field Sync. folder to the /wp-content/plugins/ directory. Admin can sync the HubSpot contact properties with WordPress user’s fields. The administrator can add multiple rows or also delete the existing rows for mappings. 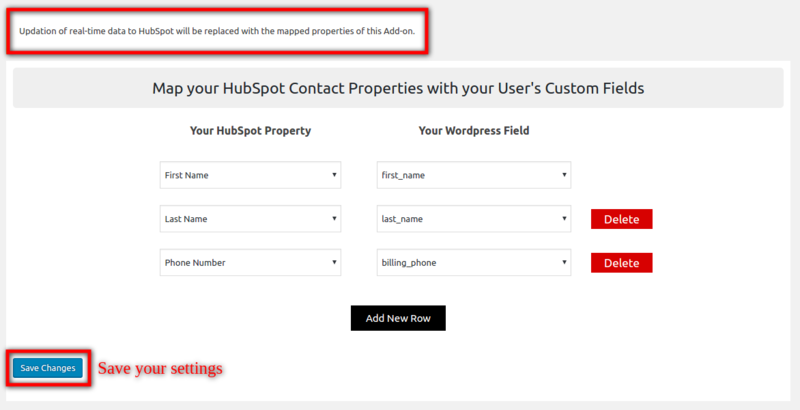 By clicking on the “Add new row”, admin can create multiple mapping between HubSpot contact properties and WordPress user’s field. The admin can proceed by adding multiple mappings and specifying the fields which he wants to map. The fields will get mapped and synced once the customers’ data will get updated over HubSpot. HubSpot contact properties can be selected from the left section. You can select the desired property from the dropdown which is to be mapped. WordPress user’s fields can be selected from the right section. You can select the desired user field which you want to map against the HubSpot property.